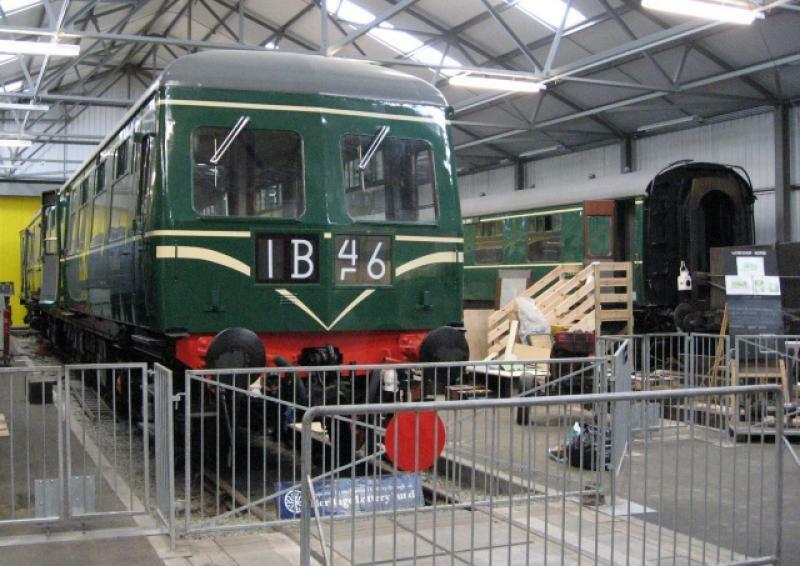 The Class 126 DMUs were 3-car units built at British Rail's Swindon Works in the 1950s. Known as 'Inter-City railcars' these DMUs were constructed on the longer 64'6" underframe and resembled Mk1 loco-hauled stock, having buckeye couplers and Pullman gangways but with a different body profile. These trains had two front-end designs: either a full-width cab, or a half-cab with central gangway connection. The latter 'intermediate' driving cars allowed through access within a six-car formation. Power-car seating was of the 'open' saloon arrangement with compartment seating in the trailers. Some of the trailer cars also featured buffets. Each power-car was fitted with two AEC 150hp underfloor engines with mechanical transmission giving a maximum speed of 70mph. A unique multiple-working control system, coded 'White Circle', was employed. Unlike other classes, each power car produced its own control air supply and was thus incompatible with any other. Two batches of Class 126 DMUs were built. The first batch of 64 cars, including eight Buffets cars, was built in 1956, for used between Edinburgh and Glasgow. These cars were numbered in the Sc79xxx series. A second batch of 68 cars (with two Buffets), was built in 1959/60 for Glasgow – Ayrshire routes, and numbered in the Sc51xxx and Sc59xxx series. The first batch was allocated to Leith Central depot, and introduced to the Edinburgh Waverley to Glasgow Queen Street route in January 1957. They worked both the express services via Falkirk High and the stopping services via Falkirk Grahamston. Appearances were also made on the Princes Street to Glasgow Central route via Shotts. The trains usually worked in 6-car formation, with the full width cabs outermost. At first the units work as pairs of 3-car sets with the intermediate driving vehicles coupled in the centre of the train. Later the formation was changed to position the trailer cars together the middle. Class 126s were displaced from E&G services from 1971 by the Class 27 push-pull sets. Despite trials on other routes, all were withdrawn by 1972 except for four cars transferred to Ayr. Five of the withdrawn power cars were refurbished by BREL at Glasgow Works, painted bright orange and exported to Africa to work miners' trains on the LAMCO system in Liberia. Twenty-two 3-car sets were introduced from 1959, based at Ayr depot. The 126s worked initially from Glasgow St Enoch, and later Glasgow Central to Stranraer, Girvan, Ayr, Ardrossan and Largs. They also appeared on other routes out of Glasgow. Due to their non-standard nature and high asbestos content, the class 126 units were withdrawn in the early 1980s. The Glasgow - Stranraer services went over to loco-hauled operation in May 1982. On other routes the 126s were replaced by redeployed class 101 and class 107 units. The last two sets, 126.406 and 126.413 were withdrawn in January 1983. The most obvious difference between the two batches was the headcode indicators. The E&G units had a single character panel, while the later built Ayrshire sets had split 4 character panels. The E&G units had guards vans behind the driving cabs, but the Ayrshire units had the guards van at the inner end of the driving car, allowing passengers seated behind the 'full cab' a forward view. Initial liveries for both fleets was lined green, at first a bright shade, but a darker brunswick green was later applied. E&G units were repainted into 'Inter-City' blue and grey from 1967 onwards, but the Ayrshire units were painted 'suburban' plain blue. From 1977 onwards, the Ayrshire units received blue and grey livery, from 1979 with 'GG TransClyde' branding. Around this time the gangways on the driving cabs were removed. One 3-car Ayrshire set was saved by the Swindon Diesel Preservation Society. Comprising of DMS Sc51017, DMBS Sc51043 and TC Sc59404, it was initially used on the Caledonian Railway at Brechin. The unit was sold to the Scottish Railway Preservation Society in 1993, to enable the asbestos insulation to be removed and full restoration to take place. It is now based on the Bo'ness and Kinneil Railway. Two of the E&G buffets cars were bought by preserved railways. Car 79441 was on the Strathspey Railway, but has now been scrapped. Car 79443 went to the North Yorkshire Moors Railway, but is now at Bo'ness awaiting restoration. Created by Dysgraphyk and last modified by s0233171 at 16:14, 15 of June 2008.